Vertical tank is satin-finish stainless steel. Valve dispenses all-purpose hand soaps. Capacity: 40 fl oz (1.2 L). Soap refill window. Concealed wall fastening. Hinged filler-top requires special key to open. Vandalresistant. 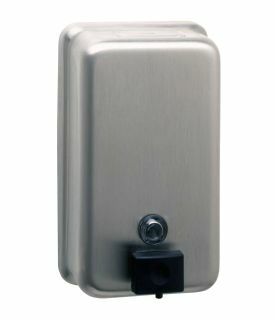 Unit 4 3/4 inch W, 8 1/8 inch H wall to push-button, 3 1/2 inch.